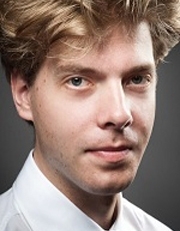 Jan Grüning, violist of the award-winning Ariel String Quartet, earned his Bachelor’s degree at the Musikhochschule Lübeck under the tutelage of Barbara Westphal and his Master’s at the New England Conservatory under Kim Kashkashian. He has conducted further studies with famed musicians including Yuri Bashmet, Steven Isserlis and Ferenc Rados. In 2005, he was the recipient of an award from the Marie-Luise-Imbusch Foundation; in addition, a prestigious scholarship of the DAAD (German Academic Exchange Service) enabled him to study in Boston at NEC. He has had the honor of performing with organizations such as the Berlin Philharmonie, Berlin Konzerghaus, Herkulessall Munich, Philharmonie Cologne and Suntory Hall (Tokyo) among others. As a member of the Ariel String Quartet (CCM String Quartet-in-Residence since 2012), Grüning has shared in winning the Cleveland Quartet Award, Grand Prize at the Fischoff National Chamber Music Competition (South Bend, Ind. ), First Prize International at the “Franz Schubert and the Music of Modernity” Competition (Graz, Austria) and 3rd prize at the Banff International String Quartet Competition (Banff, Alberta, Canada). (The group also received the Székely Prize at the Banff Competition for Bartók performance.) He has been honored to share the stage with notable performers including Menahem Pressler, Alisa Weilerstein, David Krakauer, the American String Quartet and the Jerusalem String Quartet. During their stay at CCM, they have had the honor of giving a complete performance of all of Beethoven's string quartets (dubbed "The Cycle") in early 2014, a feat they also repeated at the University of South Florida and SubCulture (New York). Grüning and the other members of the Quartet are touring and concertizing extensively in North and South America, Canada, Europe, Israel and Asia; these travels have included multiple appearances in New York’s Carnegie Hall, Kennedy Center for Performing Arts, 92nd Street Y and Alice Tully Hall at Lincoln Center, as well as prestigious international locations including Kaisersaal (Frankfurt, Germany), Musée du Louvre (Paris) and others. BM, Musikhochschule Lübeck,, Lübeck, Germany. MM, New England Conservatory, Boston, Mass..